A fleet of high-tech robots is now deployed at a northern Virginia university to serve the noble purpose of delivering pizza, doughnuts and coffee on demand to students who summon them. 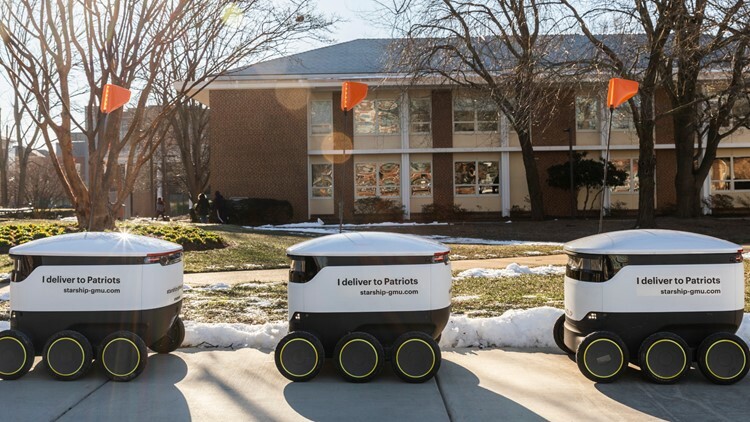 FAIRFAX, Va. (AP) - A fleet of high-tech robots is now deployed at a northern Virginia university to serve the noble purpose of delivering pizza, doughnuts and coffee on demand to students who summon them. Starship Technologies announced Tuesday that its delivery robots are now in use at George Mason University in Fairfax. The company's partnership with Sodexo, which holds a catering contract at George Mason, means that students can get deliveries from Blaze Pizza, Starbucks and Dunkin for a $1.99 fee. More vendors are expected to join the program later. The six-wheeled robots, shaped like a cooler, can climb curbs and hold up to 20 pounds of cargo. Starship says its rollout of more than 25 robots makes it the largest implementation of autonomous robot food-delivery services on a college campus.